In the previous article Growing Turmeric in Containers in Temperate Climates, I mentioned that I had also discovered a temperate climate technique for growing turmeric in the ground. For those who like to grow plants out of their climatic range without a greenhouse, we’ll explain not only how it’s done, but we’ll explore the systems-thinking approach to developing this clever permaculture design solution! It’s one thing to give readers a simple technique to follow, but it’s much more valuable to explain the thinking behind the solution in order to understand the concept from first principles. A little about the plant to begin with, turmeric (Curcuma longa syn. C. domestica) is a member of the ginger (Zingiberaceae) family. It’s a subtropical/tropical plant native to Southwest India, and its roots, more correctly described as a rhizomes (horizontal underground plant stems producing shoots, roots and new plants) have been used traditionally as a spice, medicine and as a source of bright yellow dye. How do we grow turmeric? How do we grow any plant for that matter? All plants are adapted to specific locations, conditions and environments, they all have a particular ecological niche. The more their growing environment varies from their native environment, the more difficult it will be for the plant to survive. How do we increase the odd in favour of the plant’s survival? By creating a favourable growing conditions that replicate its native environment as much as possible. By first understanding the growing requirements and attributes of a turmeric plant, we are better placed to provide the plant with what it needs to grow and thrive. Turmeric is a perennial plant which prefers rich, moist soils in a protected, shaded position. It’s drought and frost tender, so it wont tolerate drying out or exposure to frosts. The plant grows to 0.5m high x 0.5m wide, and produces attractive fragrant white flowers. It grows relatively easily in tropical and subtropical climates, and can be grown in pots and containers. In Permaculture, when we work with any design element, we endeavour to fully recognise all the properties of an element, and when this element is a plant or animal, we seek to gain a thorough knowledge of this organism. This includes it needs, outputs, attributes, the optimum conditions and the range which it can tolerate. One way to do this is to perform a functional analysis to identify an element’s needs, products, behaviours and intrinsic characteristics. From what we understand of tropical environments, high tree canopies stretch towards the sky, creating dense shade underneath. This creates a shaded, humid microclimate in the understory below. The broad leaves of turmeric plants are an adaptation to low light levels, broad green leaves capture as much light as possible, and high moisture loss through the large leaves is not an issue, as there is plenty of water in the soil and high humidity in the air. The height of the turmeric plant of 50cm is a giveaway that it forms part of the low understory in its native environment. Plants are protected from any winds by the dense undergrowth beneath the high canopy trees, allowing them to thrive in their location. Tropical soils are not usually very deep, so the turmeric rhizomes don’t run too deeply in the ground. With this information we can begin designing an environment in a cool temperate climate that will support turmeric plants in a garden bed! Most gardeners are familiar with the concept of companion planting, and in Permaculture we take the concept a step further with planting guilds, a community of plants that grow well together because they benefit and support each other, forming an ecological ‘mutual support network’. In order to select appropriate support plants to create a planting guild, we need to think analytically to deduce all the specific plant requirements. We then need to think holistically to formulate a creative solution to make all the plants work together! We’ve already ascertained that turmeric plants need to live under the cover of taller plants and trees which are evergreen, thus providing them with canopy cover all year round. The evergreen canopy will not only provide dappled shade, but also act like an umbrella to deflect rain,keeping the area below much drier during winter rain periods. In respect to plant height, the overhead canopy cant be too low, as it needs to allow space for the 50cm high turmeric plants to grow below, but it also can’t be too high, otherwise it won’t provide effective shelter. A 1m high clearance below the canopy would be ideal for a plant of this height. When it’s raining, soil will inevitably get wet and water will permeate through the soil, so it’s important to have a means of removing excess water around the turmeric roots in winter, if they get waterlogged they’ll quickly rot. All plants transpire, they take up water from their roots, and water vapour escapes through the pores in their leaves, so we can use plants for the purpose of reducing soil moisture. Some plants hang on to water better than others, and in winter, without the heat, many plants don’t have very high transpiration rates. Ideally what is needed to protect the turmeric from waterlogging is a plant with very big leaves which will act like a large umbrella for plants below, and transpire well in winter, taking up lots of water. How do we find such a plant? Simple, we look for ‘problems’? …typically, people see a disadvantage as a ‘problem’ and then implement an energy-intensive ‘solution’ to attempt to ‘fix the problem’. The other option is to take a different attitude, look at everything as a positive resource, and figure out how to make use of it! We can get creative and think of all the ways we can turn these disadvantages into useful things we can use in our system. To find our ‘solution plant’, we need to find a ‘problem plant’ and then turn our perspectives around. What plant will take up a good amount of water in winter? One that needs plenty of water in summer! Using simple botanical theory, plants with wide leaves have larger surface areas with more pores (stomata) underneath to lose moisture. The pores can open and shut, but more surface area always means more moisture loss. provides other benefits – edible? The plant I chose for this purpose is a cold-climate tolerant dwarf banana, it fulfils all the above requirements. Shown below is a turmeric plant growing under a dwarf Cavendish banana, which grows to 1.5-2m tall. There’s also a second turmeric plant growing on the right hand side, but it’s not visible in this photo. 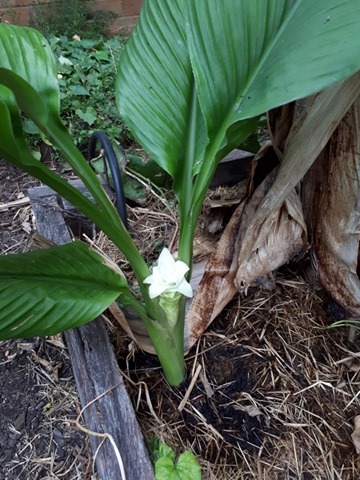 Turmeric plant with flower growing under banana, first year. The surrounding environment also plays a critical role in Permaculture design. In the photo below what may not be evident is the design of a sun trap. I’ve created an alcove, much like a horseshoe shape, backed by a brick wall which serves as a thermal mass, with screens of plants, trees and climbers flanking it on both the left and right sides. All this serves to cut winds from the sides and keep the heat in. To capture the heat, the garden bed faces north (in this Southern hemisphere location, which is towards the midday sun). Here are the plants in their second year of growth, they perfectly survived freezing temperatures of a particularly cold winter, and extreme summer heat with dry winds, so the design works as intended! 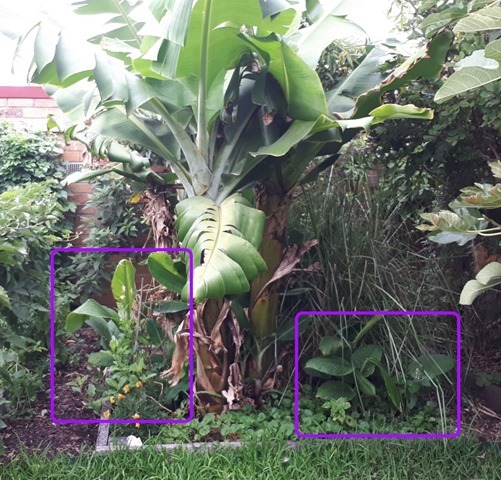 The same location, a year later – turmeric plant growing under banana, second year. In case the turmeric plants are hard to see, I’ve highlighted their locations! Since turmeric isn’t particularly deep rooted, it really benefits from a good layer of mulch to preserve soil moisture. I’ve experimented with using a living mulch, a groundcover plant which, in typical permaculture fashion, has multiple uses. For a living mulch, I’ve used the Alehoof plant, Glechoma hederacea, is a hardy perennial groundcover plant which can spread out to around 2m wide. This plant is native of Europe, and in modern herbalism it’s referred to as Ground Ivy. It prefers moist, rich soils in a protected shaded position, it’s frost resistant but drought tender. In the background I’ve grown a tough tropical grass which also has multiple uses – Vetiver Grass, Vetiveria zizanioides, a perennial clumping grass native to tropical Asia, which prefers moist, well-drained soils in an open sunny position. It grows up to 2m high, and its roots run equally deep, making it a valuable plant for stabilising slopes and stopping soil erosion0 The leaves are cut and used as mulch. The roots are used used medicinally, and to produce an aromatic oil which is used as an insect repellent. When the vetiver grass gets too tall, I cut and mulch it, then lay it down around the banana to retain soil moisture in summer. 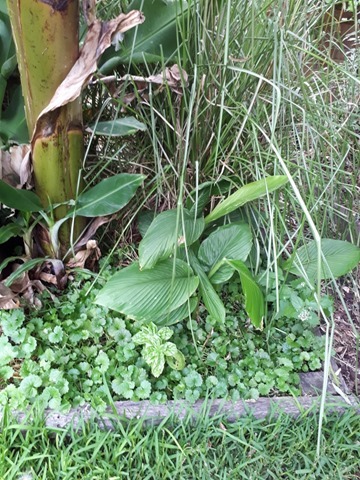 Close-up of turmeric plant growing on right hand side of banana, with subtropical vetiver grass in the background, and a groundcover of shade-loving alehoof plant. Creating a subtropical microclimate has the benefit of providing a useful space where other subtropicals can be grown also. The bright green plant in the foreground supported by a bamboo stake is a Sambung plant, Gynura procumbens, a perennial fleshy leafed plant native South East Asia, which grows at the edges of tropical forests. It’s also called Sambung nyawa which means ‘life extender’ in Indonesian, alluding to its many medicinal properties. Sambung is also used as an edible plant, the leaves can be used fresh or cooked. 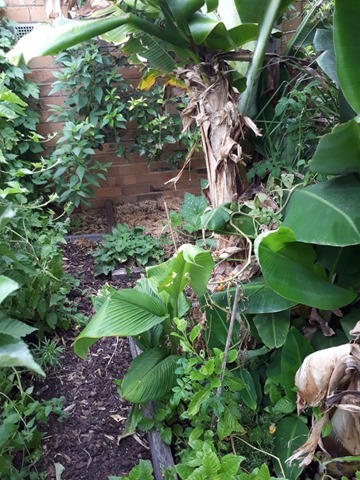 Close-up of turmeric plant growing on left hand side of banana, with subtropical edible sambung plant in the foreground. From this example it is evident that guild plantings work well when they’re designed properly. 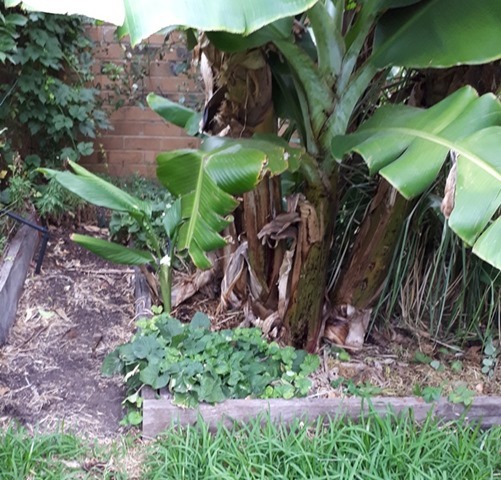 In this garden bed the plants all seem to be doing very well together, the turmeric is multiplying very happily below the banana plant and it’s been growing there for two years now. This garden planting has proven its resilience by surviving one cold winter wet and two summer heat extremes. In 2018, in Melbourne, Australia, we experienced the coldest start to winter in 36 years, and during winter the temperatures dropped below freezing several times, with the landscape frosted over. Summer wasn’t much kinder either with both 2018 and 2019 summers reaching high temperatures above 40 degrees Celsius (104 degrees Fahrenheit) often, with very powerful hot dry winds accompanying them. The turmeric plants has survived all this and has even put on lots of growth, there are multiple plants where each single plant was planted. There are hotter and colder places in the world, but remember we’re talking about a fairly delicate subtropical plant here, and the 44 degrees Celsius (111 degrees Fahrenheit) scorching winds that turned lawns to straw aren’t exactly friendly to tropical-loving turmeric! With Permaculture design, we can solve the problem of growing plants out if their climatic range if we understand the needs of plants and how plants work together in Nature, and combine that with the will to experiment and learn… and then share our knowledge with others! This entry was posted in Gardening Information, Permaculture, What's New! and tagged growing turmeric, growing turmeric in Melbourne, growing turmeric in temperate garden bed, temperate climate, tropical plants in temperate climates. Bookmark the permalink. Thanks for sharing this e-x-t-r-e-m-e-l-y useful tumeric growing guide! You have a point that growing a plant out if its climatic range can be a great challenge, but with the right approach you can not fail to achieve a good result!